During her recovery from a mastectomy for primary cancer and closely followed by the death of my father, the artist Eric Ravilious, in 1942, my mother, Tirzah, wrote an entertainingly direct and perceptive autobiography of their life together. She was thirty-four and the mother of three young children. As a student, she had excelled as a wood engraver. She now rediscovered the creativity that had lain virtually dormant throughout her married life. She began painting in oils, but also produced a series of captivating images of local Essex houses and shop fronts, (1944–1949). She soon developed her own distinctive style, where each one was lovingly recorded with a mixture of print and collage which she assembled and sometimes constructed into a 3D model in a shallow box frame. 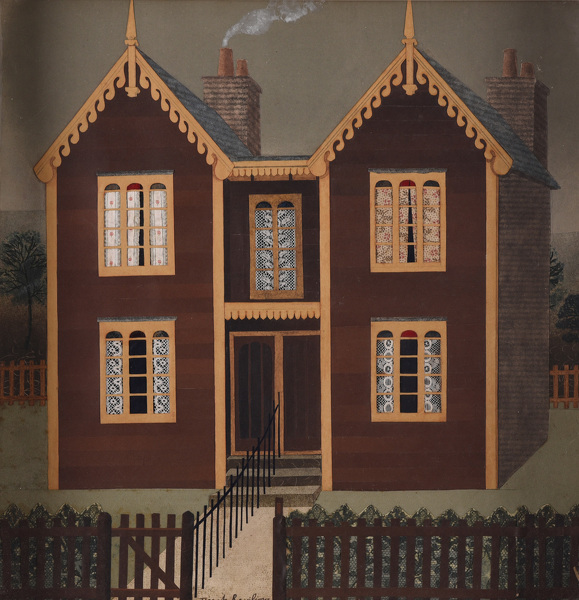 This early example, Semi-detached Villas, has the barge boarding and paint work picked out in ochre against the dark brown house, and the deep wooden frame painted white gives an added spatial dimension to the image set back behind the glass. A quantity of sketches of architectural details suggest that all her subjects were from real life. The key to the success of Tirzah’s series of houses is that as a painter might set about portraying a human face, so Tirzah, by isolating the subject and stressing the features that most interest her, brings out the individuality that had originally attracted her to her subject. This picture was once owned by her friend, Kenneth Rowntree. Commentary by Anne Ullman. Ullman took a Negotiated Art Degree which included a module researching the lives and work of her parents, Tirzah Garwood and Eric Ravilious. She has published her father’s letters and her mother’s autobiography and is currently working on a book about her mother’s career.